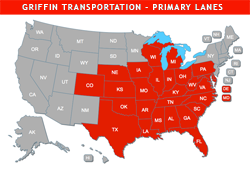 Griffin Transportation, Inc. (Griffin) was started in 2008 by Craig Scholten and Ryan Bos. The Company was founded by experienced transportation people to provide quality truckload service to customers in Michigan and neighboring states. By emphasizing quality service through on-time delivery, safety and competitive pricing, Griffin quickly grew into one of the best truckload carriers in the Midwest. Based in Grand Rapids, MI, Griffin provides dedicated truckload and logistics services to customers with dry van freight needs. Such services are provided by both Griffin’s own fleet of late model tractors and dry van trailers and also a network of similarly qualified and respected partner carriers. Delivery of quality service begins with understanding the needs of our customers. At Griffin, our experienced transportation and logistics team works with our customers to learn their business in order to provide cost-effective transportation solutions. Griffin aims to help customers get their products to market quickly, in the most safe and cost-effective manner. At the forefront of Griffin’s commitment to quality service delivery is a team of experienced and highly-skilled professional drivers. Our drivers are the best in the industry, and they represent people who place a high degree of emphasis on courtesy, conscientiousness, respect and safety. Griffin drivers deliver. Griffin is committed to delivery of quality customer service by attracting, training and maintaining a diverse and high-caliber workforce. Our workforce is governed by the basic core values of how we do business. We will be open and truthful in all of our dealings and communications with customers, suppliers, coworkers and other stakeholders of our business. We will conduct our business in a manner that is ethically and morally sound. We will be dependable and trustworthy in terms of our actions and commitments. We recognize the uniqueness and diversity in people and understand it is important to show regard for the worth of people. We will show regard for worth by treating people with courtesy, politeness, civility and restraint. We will strive to help our customers achieve their business mission by utilizing our resources in a way that will add value. At Griffin, we believe that only through a set of business values can we deliver value.